Have you ever noticed that clutter in your house tends to depress you? Do you feel overwhelmed with the amount of unwanted and unneeded junk in your house? Maybe it’s time to do some early spring cleaning so that you can lose some extra weight and lift that dark cloud that haunts you every time you come home from work. 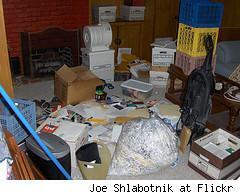 Recent studies have shown that there is a link between being over weight and the amount of clutter in your house. ” Get a euphoric runner’s high without running. Releasing useless material items can deliver a mental lift, leaving more time for positive habits — like a real jog. Dust mites love soft items. Relieve allergy symptoms by getting rid of unworn clothing, decorative pillows and stuffed animals not adored anymore. Schwartz, a wellness coach, looks at all aspects of a client’s life. She encourages patients to tackle their clutter so they can cross it off their often-overwhelming to-do list. People are often stressed out and paralyzed over their messy homes. Cleaning is easier and faster when there is less stuff. Overeating is often triggered by stress, and eliminating an aspect of stress can help calm cravings. Schwartz encourages patients to focus on the clutter that bothers them the most and not to worry about decluttering the whole house at once. Could it be that all these years you, a friend, or family member has been overweight could have been solved with a simple trip to your local goodwill? If you have clutter in your life then it’s time you cleaned out your house so that you can feel refreshed and have time to focus on more important thing… YOU! This could be the year that you actually keep your new years resolution to get organized and fit.